How to turn Off or On Automatic Image Resizing in Internet Explorer 6. 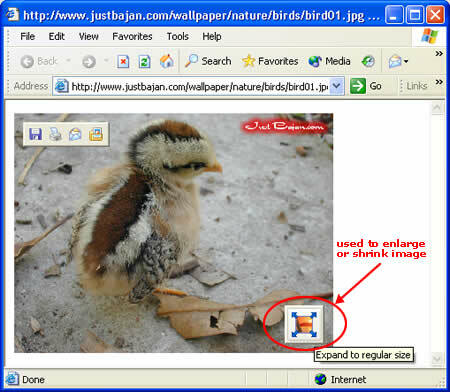 Internet Explorer 6 has a new feature which automatically resizes images. If an image is too big to fit completely in your browser window, Internet Explorer can automatically resize it to make it fit. This prevents you from having to scroll to see the full picture. When you place your mouse over the image an icon appears in the bottom right corner. Clicking it expands the image to its original size and clicking it again resizes the image to fit your window. The Icons and an example of where they appear are shown below. On the other hand, you may not want Internet explorer to resize your images at all. You might prefer to see them full sized by default... especially if you are downloading an image of a cute chick, you want to see it full sized, not shrunken. In this tutorial you will learn how to turn the Automatic Image Resizing feature on or off. Step 5: Click the "OK" button on the Internet option dialog box to finish.